Spending some money on good exterior doors is a good investment. These doors often become the focus point of the house. Quality is also a key factor as they are constantly exposed to weather conditions. If you compromise with quality and price, signs of wear will show prematurely and impact the overall image of your property. Exterior doors that are designed to compliment any style of home. One of the most common choices are the wooden exterior doors, which provide a warm and natural appearance. Even though these are quite vulnerable to extreme weather conditions, they have gained popularity over time. However, the wood usually cracks after prolonged used and extended exposure to harsh weather. It may even bow or warp. Sometimes, the wood fibers swell or shrink. As far as designs, styles, and sizes are concerned, there is a wide array of products you can choose from. While you can always choose the conventional wooden model, other modern alternatives are available too. High-tech designs made of fiberglass composites and steel are quite popular. When you make the purchase, you can either buy only the bare bones or invest on the complete entry system. This comprises of a pre-hung door in its sturdy frame. Even though there are plenty of options, wood is amid the most popular choices as far as building materials are concerned. It offers a classic look which will never go out of style. Many people select wooden doors with steel interiors. Fiberglass or steel door can also be bought with wooden frames. These usually have a core designed for foam insulation. When you build a house or renovate, the budget is a key factor which determines what like of appliances you will buy. The cost of external doors varies largely based on various factors like overall appearance and durability. You must also consider the security it provides as it enables and restricts entry into your home. Many people fancy the idea of paneled or flush external doors. Flushed doors are flat on both side and are smooth. The panel exterior doors flaunt rectangular recesses, framed by horizontal rails and vertical sites. These are designed to minimize cracking and warping as the panel rooms shift when they contract and respond to humidity by expanding accordingly. Some doors feature door lights and have panel construction with multiple lights substituting for panels. Terrace, patio or any other exterior doors are hinged. They often have glass lights. External French doors and hinged glass lite doors are options you may consider. The hinged doors are installed in pairs but they can swing independently. The sliding doors are a cool option. One panel is fixed while another can glide along the tracks. These are simple and easy to operate. If you wish to avoid the heavy impact of weather, this is a great option. Sliding doors are also great because they do not block light. Depending on your personal preference, you can buy left-hand exterior doors, which will open towards you. The knobs are on the left side of the exterior door. The right-hand exterior door will open towards you as well but the knobs are on the right side. Keep in mind that a good front entry door must be able to provide you with the security you need. In addition, because it is the first impression your visitors get, it must add a subtle touch of elegance to the property. 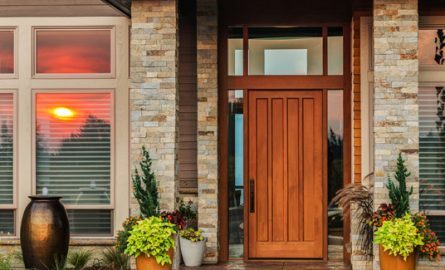 The exterior door can significantly increase the value of your home. Take time to analyze different models and then choose one that best matches your home.